Planning a trip to Sunshine Coast? Don't spend hours on the web looking for travel deals and cheap flights and hotels. Use Webjet to browse holiday package deals and getaways to Sunshine Coast in Australia and find the best one for your budget. Hassle-free Experience: Instead of planning everything yourself, choose a tailor-made holiday package and deals where all the work is done for you. Save Time: You won't have to search for the cheapest flights and getaways to the Sunshine Coast or try to find the best hotel deals. World-class Service on a Budget: By purchasing a holiday package deal to Sunshine Coast, you can take advantage of exclusive discounts and stay at top hotels without the hefty price tag. No hidden costs: You won't pay more than the price listed for your flight and hotel bookings. Noosa National Park is home to more than 9,800 acres of forests, beaches and dunes. There is 15 km of hiking trails to explore and plenty of wildlife to spot on the way. Before starting your trek, stop by the visitor's centre to check for any animal sightings. If you're lucky, you might even spot a sleeping koala in one of the eucalyptus trees. Made famous by Aussie conservationist, Steve Irwin, the Australia Zoo is one of the country's top attractions - a year-round outing for those in Queensland thanks to a great holiday deals. The Zoo spans across 110 acres and has exotic animals from all around the world. Besides watching croc feeding demonstrations, you can visit the animal hospital and help some of the animals in need. One of the Sunshine Coast's top attractions for nature lovers is the Glass House Mountains National Park. Use your Queensland getaways to hike to the summit of Mount Ngungun and Mount Tibrogargan or try abseiling, mountain biking or rock climbing. The park has rich biodiversity and is home to koalas, echidnas and grey kangaroos. 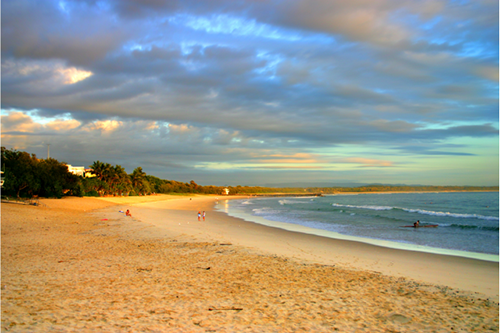 Noosa North Shore is 80km of white sand beaches. It's a popular choice for campers, and plenty of wildlife can be seen from the camping areas. During low tide, if you have a 4WD, you can drive past the Colored Sands until you reach Rainbow Beach. From there you can catch a ferry to the World Heritage listed Fraser Island. If you're looking for souvenirs to bring back home, head to Eumundi Markets. Held every Wednesday morning and Saturday, you'll find everything from organic produce to designer clothes and homemade goods. Grab lunch from one of the food stalls and let the kids burn off steam at one of the playgrounds. The easiest way to get around the Sunshine Coast on holiday getaways is to hire a car. While there is some public transportation, the routes are limited, and you won't be able to explore the many attractions outside of the city's limits. There are two seasons in Sunshine Coast. From June to October, the weather is cool and dry, and from December, it's wet, hot, and humid. Look into the weather before booking your Queensland getaways to have an idea of the weather you may encounter while you're away. Buy your tickets for Aussie World online. You'll get a discounted price on general admission tickets. There's also a shuttle bus, Con-Z-ion, that runs a door-to-door service between the Sunshine Coast and the amusement park. Hire a kayak or a stand-up paddleboard. It's a cheap way to explore the Noosa or Maroochy rivers. Eating out in Noosa is not cheap. Instead of going to a restaurant for dinner, shop at one of the local markets and have a barbecue by Sunshine Beach.